It’s National Blueberry Pie Day, in these United States. As you might have surmised, I was up on or around the Koscisuzcko Bridge all day yesterday. Saying that, one is a bit fried as normal obligation continued through the evening and even into today. 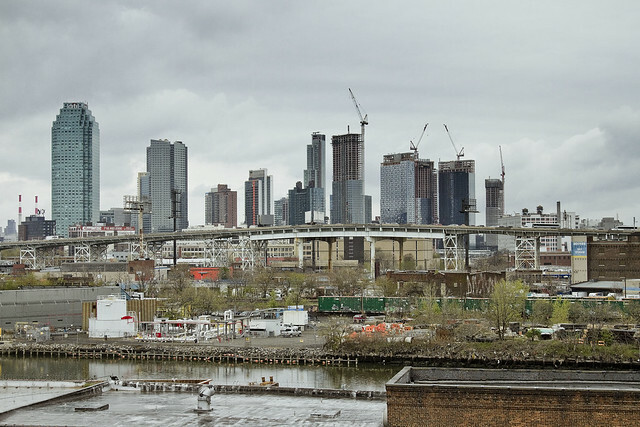 Accordingly, too little sleep and so that means this will be a somewhat abbreviated posting – a bookmark – for a milestone in Newtown Creek history. Monday, however, expect something a bit more in depth on the subject. There was a morning hullabaloo, followed by an evening hullabaloo, which punctuated me running back and forth to Astoria to develop shots. By the time you’re reading this, vehicle traffic is now passing over the new bridge and the old one sits fallow for the first time in 78 years. Lots of cool stuff was observed, experienced, and so on – more on it all Monday. It’s National Prime Rib Day, in these United States. 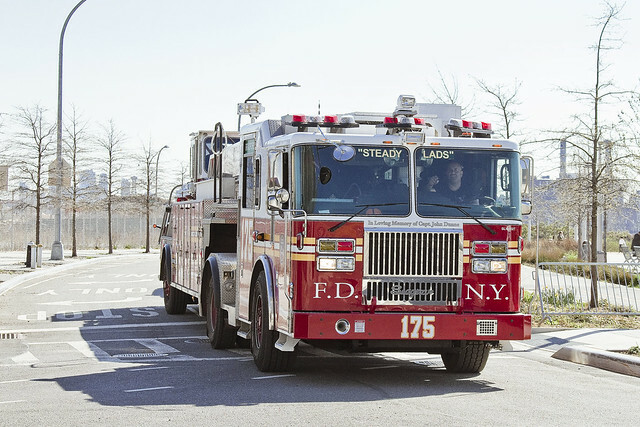 A recent afternoon found one wandering about the waterfront in LIC whereupon FDNY’s Tiller Ladder 175 truck was encountered. For those of you not in the know, Tiller Ladders are those “old school” fire trucks with a driver at both ends. 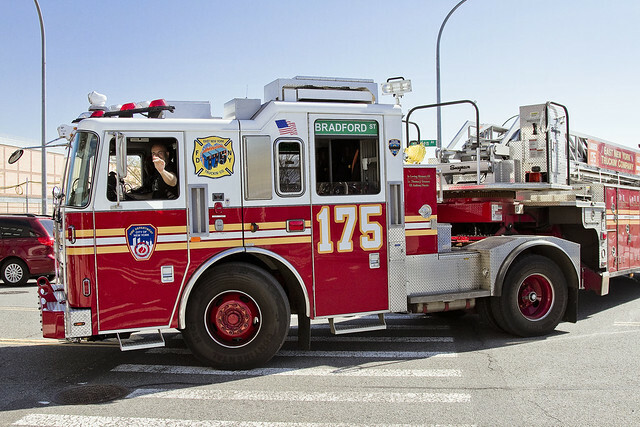 This one was Ladder 175, which normally spends its time over in East New York, but based on the patches worn by the FDNY guys driving it, I’d say that Ladder 175 was in the possession of the Fleet Services unit that day. 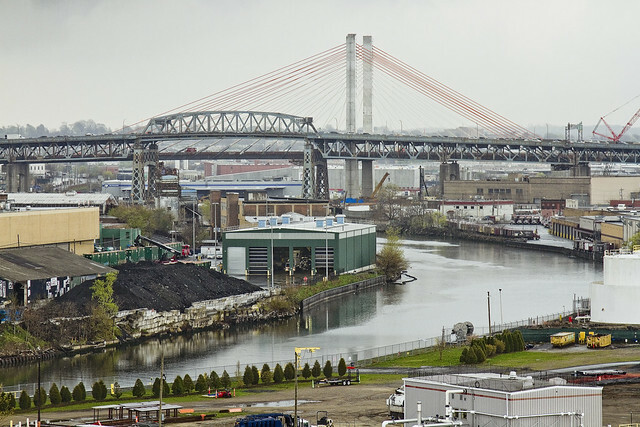 Fleet Services have several properties in Maspeth and in Greenpoint, all within spitting distance of the fabulous Newtown Creek, and you can often spot interesting equipment awaiting mechanical or esthetic attention. Saying that, I don’t know if East New York was part of the BFD, or if it was an independent operation. 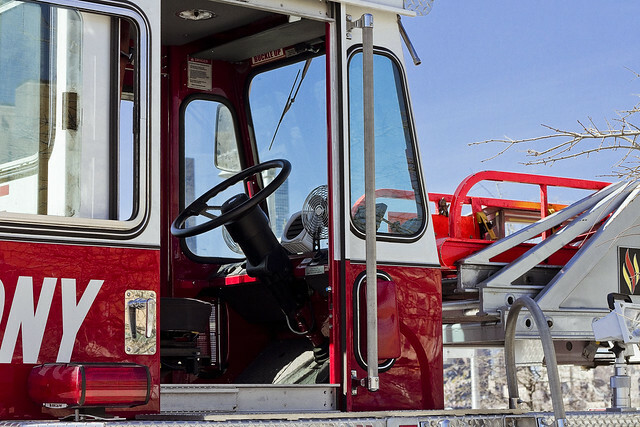 The design and purpose of the tiller models is built around turning the ladder unit around narrow street corners, which is accomplished through the use of the double steering mechanisms. 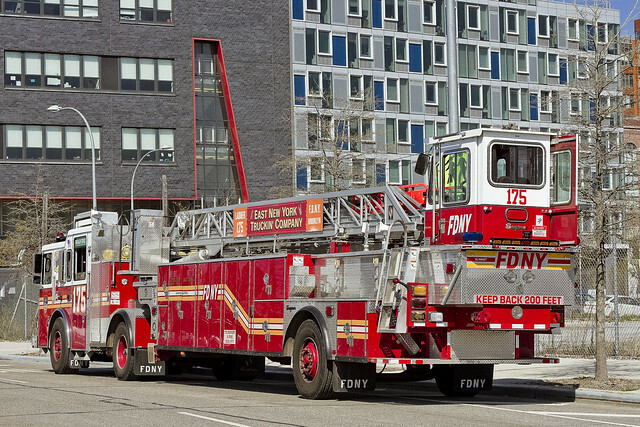 The trucks are also quite a bit longer than the tower ladder units, which extend and telescope their ladders from a turntable. This means that the tiller trucks can carry more equipment and muster more firefighters than more traditional units. That’s the rear operators cabin, with steering wheel and other controls. As they drove away, I yelled out “are ya lost?” and “east New York is that way” while gesturing to the southeast. You literally never know what you’re going to encounter in LIC, so it’s best to carry a camera, just in case. It’s National Pretzel Day, in these United States. Last Friday, the 21st, was the centennial of the opening of the IRT Flushing line from Queensborough Plaza to 103rd street Corona Plaza. Access Queens, a transit advocacy group which has grown out of the 7 Train Blues Facebook group (which I’m a steering committee member of) produced a celebration for “Our Train” with the cooperation of the NY Transit Museum. Here’s the Access Queens page describing the effort. It was a very Queensican kind of day. Pictured speaking above are Jodi Shapiro of the Transit Museum, who is curating an exhibit for the museum about the 7 line which will open in late July, and Subway historian Andrew Sparburg. 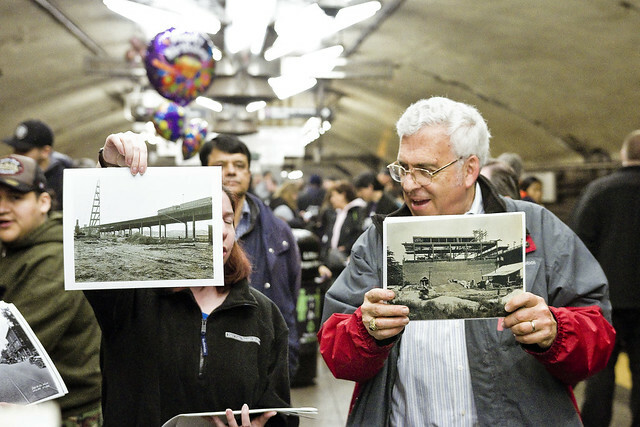 Also present, but out of frame were Subway historian Joe Raskin and Forgotten-NY webmaster Kevin Walsh. The whole Access Queens crew were on scene, as were 40-50 transit enthusiasts. Our template for the event was found in a NY Times article from 1917, which can be accessed here, describing the events surrounding the opening of the line which built modern Queens. 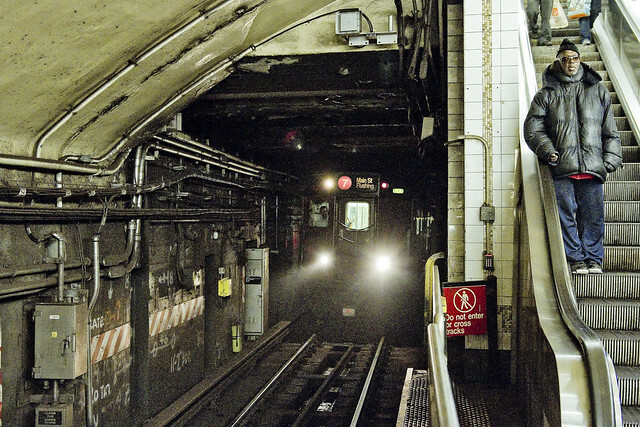 Basically, this boiled down to gathering at the Grand Central platform in Manhattan, boarding the train at two in the afternoon, and then riding out to what was the final stop on the 7 back then – 103/Corona Plaza (or as it was known back then, Alburtis Avenue). The cool bit was that when the NY Transit Museum got involved, they brought their own ride with them. The “Train of Many Colors” arrived shortly after two and we all boarded it. 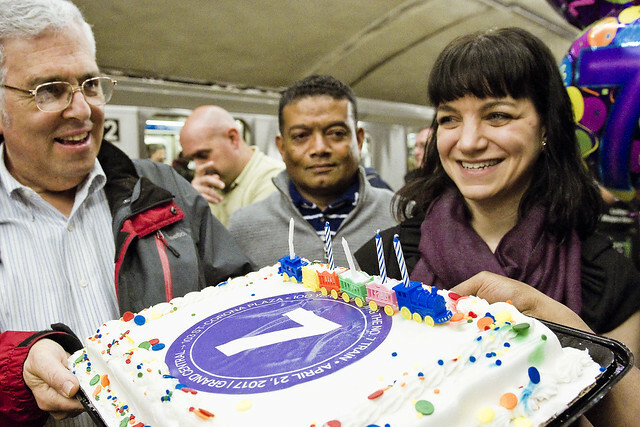 As mentioned above, there was a small legion of folks along for the ride – many of whom were youngsters that were transit nerds who knew more about the system than even MTA employees do – that attended. Everybody expressed their love for “Our Train,” even though the Grand Central Station platform was filling with smoke during the event due to a fire in Queens. 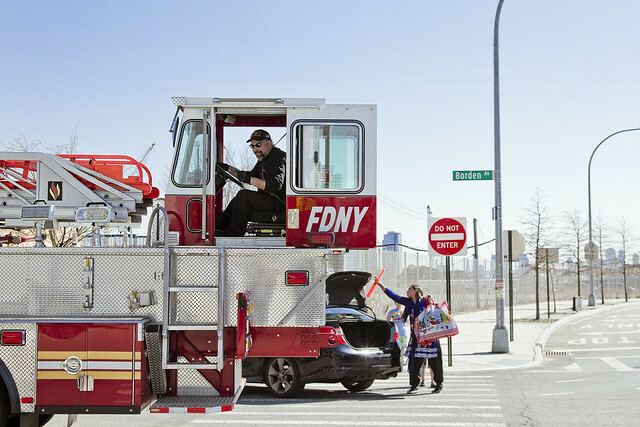 The FDNY who arrived on scene seemed to enjoy the event, at least. 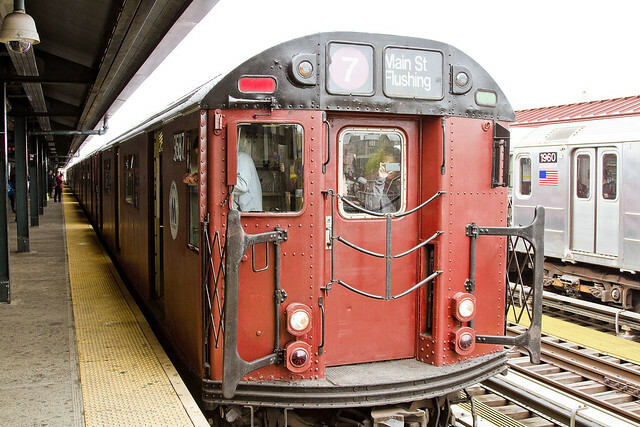 The train left Manhattan, and the Access Queens and Transit Museum folks rode it out to 103rd street. Luckily, one of my buddies – Mark Christie from the Hunters Point Park Conservancy – was aboard, and as Corona was where he landed when he originally moved to Queens from Belize – knew where to find the good eats. Mark guided us to a fantastic restaurant thereabouts where an “Al Pastor Torta” was awaiting a humble narrator. It’s National Zucchini Bread Day, in these United States. As mentioned yesterday, Our Lady of the Pentacle and myself spent a rainy Earth Day in industrial Greenpoint, and our first stop was at the brand new Green Roof at 520 Kingsland Avenue. 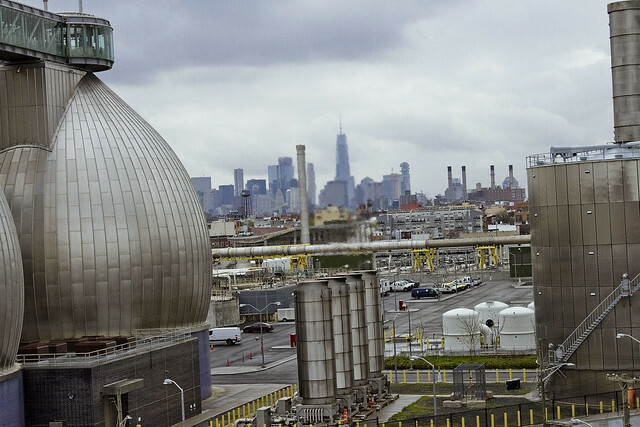 Our second appointment was with the NYC DEP, who were offering tours of the Newtown Creek Wastewater Treatment Plant pictured above. As a note, this was an abbreviated version of the tour, which only included an audience with the newly hired and immensely cool Deputy Commisioner Pam Elardo and the second Superintendent of the plant, Zainool Ali. A brief lecture on sewer operations and the DEP’s mandate was followed by a visit to the walkway that hovers over the digester eggs. The old version of the tour included a few other areas of the plant such as the electrical rooms and screening facility. 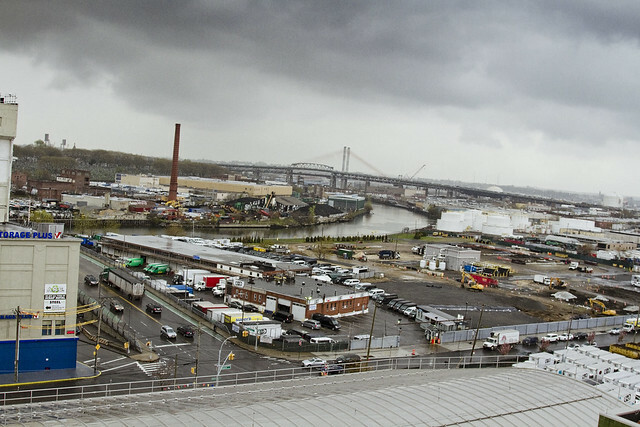 As you’d imagine – I’ve been on this tour several times over the years as a member of the Newtown Creek Monitoring Committee, my role as Newtown Creek Alliance Historian, and just out of my own puerile interest. The walkway above the digester eggs is encased in greenish blue glass, which always poses a bit of a challenge – photographically speaking. 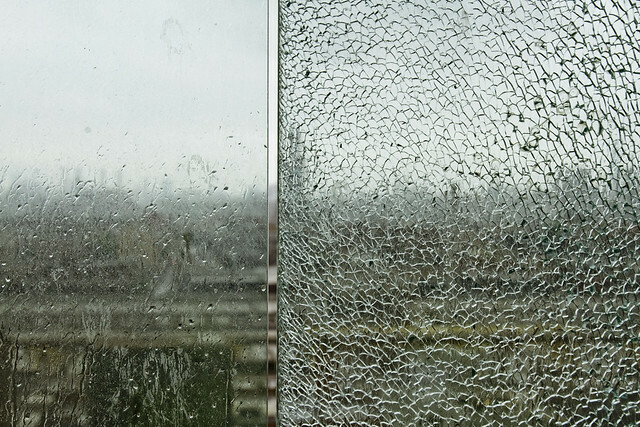 The glass tends to act as a neutral density filter and lends a color cast to the shots you can capture up there. Also, as mentioned, this isn’t my first rodeo up there – so I’ve developed certain countermeasures on both the capture and digital darkroom sides to deal with the glass issue. There’s nothing you can do about rain, however, so as my pal Bernie Ente used to advise – just use it to your advantage. One is quite enamored with the image above, which is one of the better atmospheric shots I’ve managed to capture so far this year. 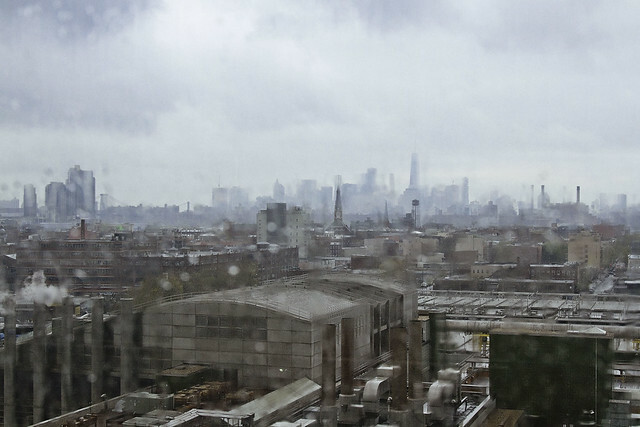 This is looking west, obviously, towards the shining city of Manhattan and over Greenpoint. Looking eastwards, towards Maspeth and the Kosciuszcko Bridge project. You’ll notice that there aren’t rain or glass distortions present in this shot, or the one below. That’s due to my having visited the walkway multiple times in the past and knowing where there are lapses in the wraparound glass big enough to shove a camera lens through. That’s probably going to be the very last “birds eye” shot of the 1939 era Koscisuzcko Bridge seen above, doing the active duty it’s been engaged in for 78 years, that I am going to ever take. 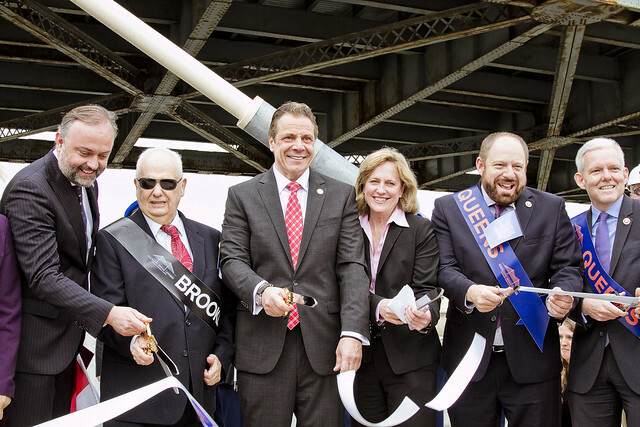 On Thursday the 27th, Governor Cuomo is going to officially open the new bridge and the NYS DOT is going to shortly thereafter reroute the BQE onto it. 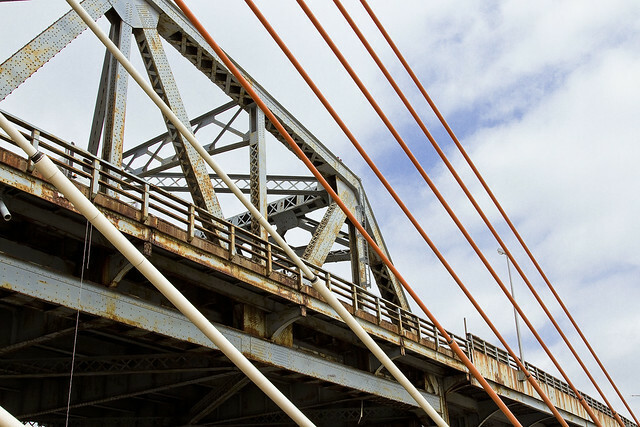 The demolition process of the 1939 bridge is meant to begin playing out over the summer and should be completed sometime this fall, whereupon the second half of the “K Bridge” project will start. It’s National Pigs in a Blanket day, in these United States. Saturday last, Earth Day April 22nd, was a misty and rainy day in the Newtown Pentacle. Regardless, Our Lady of the Pentacle and myself attended a couple of Newtown Creek oriented events and one had a chance to get busy with the camera. The shots in today’s post were captured at the Newtown Creek Alliance/Broadway Stages Green Roof project at 520 Kingsland Avenue in Greenpoint, a spot which you will have a few chances to visit with us (NCA) this spring and summer – notably on May 7th during our MAS Janeswalk event (details found at the bottom of this post). The views from up on the green roof are pretty staggering. 520 Kingsland Avenue is right at the center of the “soup bowl” as I call it, which surrounds the incredible Newtown Creek. Lately, I’ve been obsessed with the topography related to the waterway. 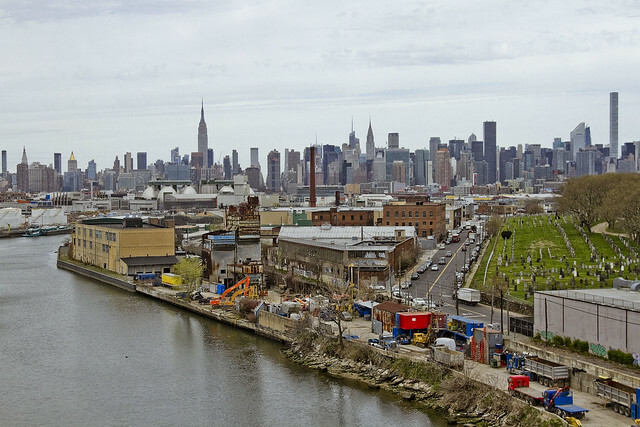 The Queens side, until you get to about two and half miles back from the East River in Maspeth is flat as a pancake – literally a flood plain which was aboriginally a series of marshes, swamps, and tidal meadows. The Brooklyn side in the same area is also fairly flat, but there’s a few undulating prominences. Bushwick, Eastern Maspeth, and Ridegwood form a literal ridge of steeper elevations around the creek. The terminal morraine of Long Island, or actual non glacially deposited rock, starts in Maspeth at Mount Olivette cemetery. That’s Long Island City, of course, with the astounding amount of real estate industrial complex activity along Jackson Avenue and Northern Blvd. 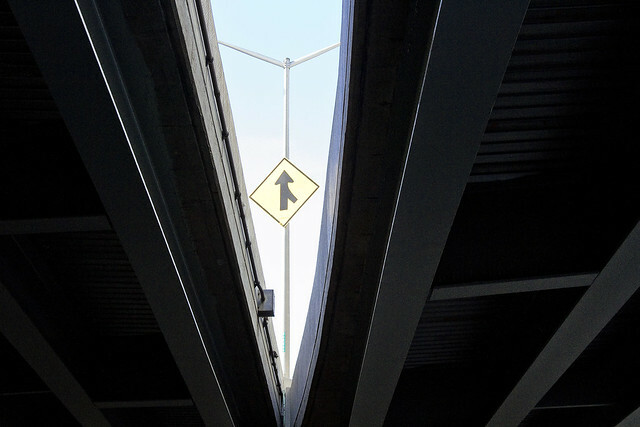 on full display as it rises behind the Long Island Expressway truss over the Dutch Kills tributary of Newtown Creek. 520 Kingsland also lets you peek into a series of industrial properties normally hidden by security fencelines and see what’s going on in them. Pictured above is part of the Metro Fuel truck fleet. 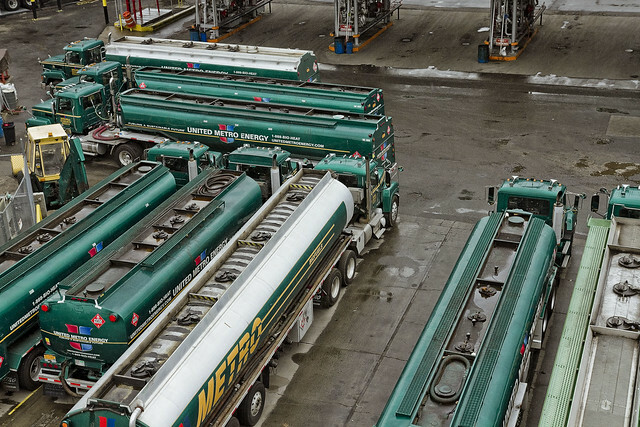 Metro is a biofuel company founded by a buddy of mine – Paul Pullo – which was purchased a few years ago by the billionaire John Catsimatidis, of FreshDirect and Gristedes supermarket fame. Metro is a biofuel company, meaning that they recycle all sorts of waste like fryer oil and cooking grease, as well as feeding soybean and agricultural oils into their mix to produce various grades of fuel oil. For more on Will Elkins’ efforts on the Living Dock – click this link to visit NCA’s page on the subject. 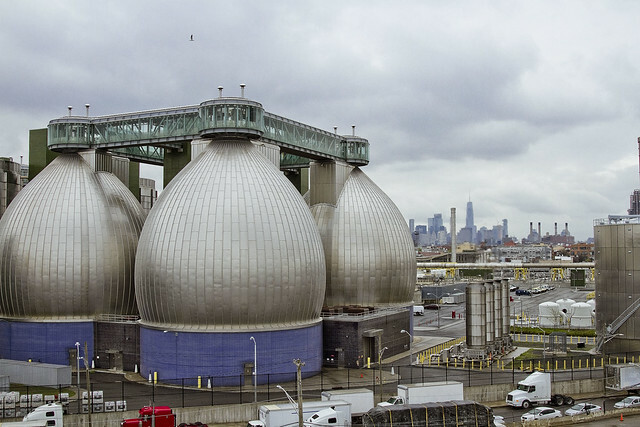 Commanding, and less common, views of the Newtown Creek Wastewater Treatment Plant are also available from 520 Kingsland Avenue. 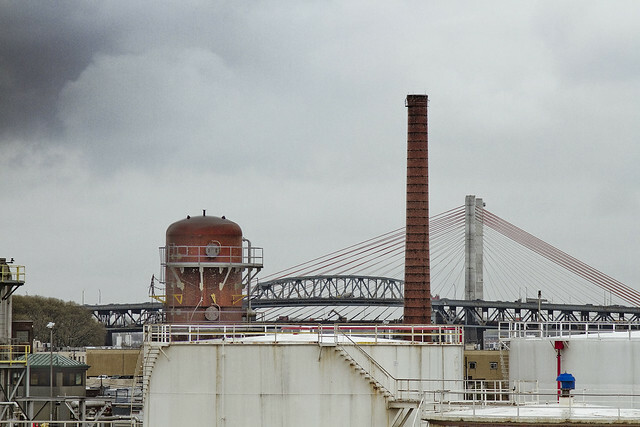 Those four cylinders in the center of the shot are actually gas jets which burn off excess methane generated by the sewer plant, making the City’s Department of Environmental Protection the single largest producer of greenhouse gases in Brooklyn. 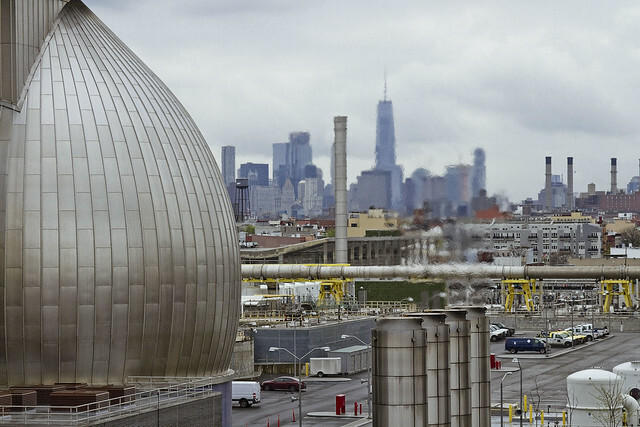 Dichotomous to their adversarial roles in the ongoing Newtown Creek Superfund situation, the DEP has entered into a partnership with the National Grid company to capture the methane instead of burning it off. The DEP calls this project “waste into energy” and it’s heraldic to the kinds of public/private partnerships which just might help ameliorate the devastating effect that climate change is going to bring to the maritime archipelago which NYC is embedded into. The 21st century is going to see a lot of these kinds of partnerships, I believe. Happily, one no longer needs to sit upon the good news that Governor Andrew Cuomo will be coming to Newtown Creek on Thursday to inaugurate and open the new Koscisuzcko Bridge, as the NY Daily News has already spilled the beans and press releases are already floating around with the news. 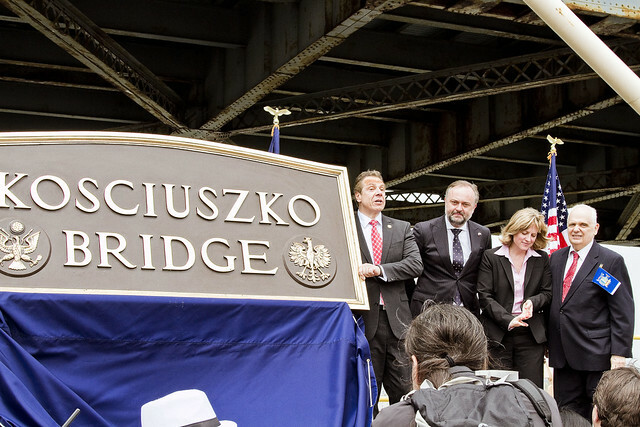 Governor Andrew M. Cuomo today announced the grand opening of the first span of the new Kosciuszko Bridge. The Kosciuszko Bridge, which will be the first new bridge constructed in New York City since the Verrazano Bridge in 1964, will be open to traffic in both directions on April 27, 2017. The Governor will mark the grand opening with a spectacular light show coordinated to music airing on multiple iHeartRadio stations. The light show is the first performance in “The New York Harbor of Lights” that will illuminate crossings with multi-color LED light shows that will be visible for miles. The shows will transform New York’s already awe-inspiring structures into international tourist attractions to drive additional tourism revenue. The premier of “The New York Harbor of Lights” will also include coordination with the lights of the Empire State Building. It’s National Chocolate Covered Cashews Day, in these United States. 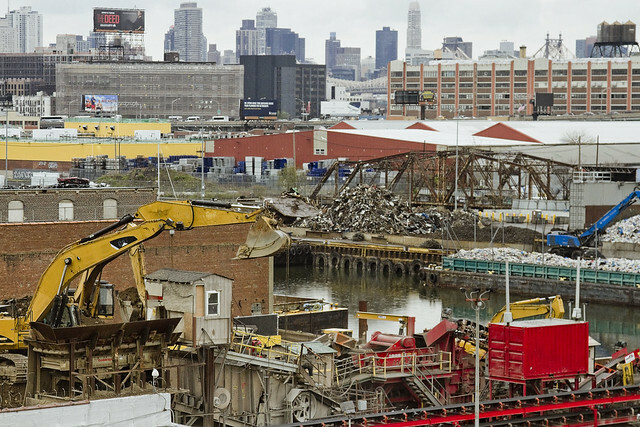 Gaze in awe upon the magnificent spectacle of the incredible Newtown Creek, that lugubrious cataract of urban neglect which doth form the currently undefended border of Brooklyn and Queens. Not saying how I got this shot, but perhaps in a great and atypical feat of athleticism a humble narrator leaped from one borough to the next. It’s possible. 7 Line Centennial Ride, April 21st – TODAY. With Access Queens and NYC Transit Museum, Free event, except for subway fare – details here. It’s National Pineapple Upside Down Cake Day, in these United States. A short one today, captured whilst wandering through the “House of Moses” in Woodside recently. You’re getting shortchanged on the post today, as I need to spend no small amount of time writing a concise series of comments and observations on the history and cultural significance of the IRT Flushing Line instead, for the celebratory events surrounding the centennial of the Corona Extension, which are tomorrow. Do normal people ever say things like this? 7 Line Centennial Ride, April 21st.